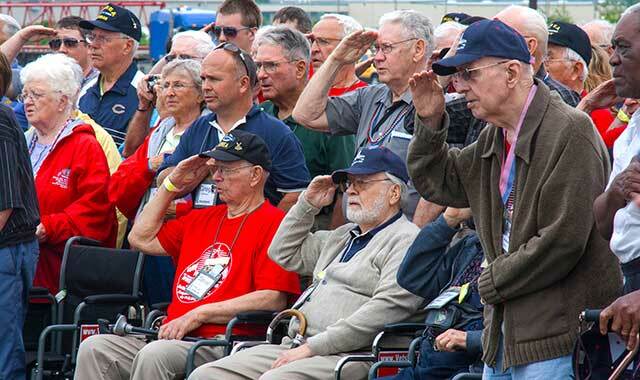 Since 2010, a group of dedicated volunteers have escorted annual caravans of buses filled with hundreds of veterans from World War II and Korea, as well as numerous “Rosie-the-Riveters” (women who worked in defense plants during that era) to Washington, DC, to view the memorials dedicated to their sacrifices. Called VetsRoll, the project is the idea and continuing enterprise of the Finnegan family, owners of Finnegan’s RV Center in South Beloit, Ill.
“My brother John, my wife Darlene, and I wanted to do something as a tribute to our parents and their generation,” says Mark Finnegan. Their father, Cy, who passed away in 2000, was a motor machinist in the Navy during World War II. Their mother, Barbara, who still lives in Beloit, worked in local defense industries during the war. In fall 2009, the Finnegans were contacted by ABC-TV’s Extreme Makeover: Home Edition to provide RVs during the production of a show in rural Lena, Ill. As an added contribution to the family whose home was being filmed, the Finnegans raised almost $12,000 from various donors in four days. “It convinced us that, even in tough times, if the cause was right, people would still support it,” says Finnegan. The following year the Finnegans learned of the Honor Flight Network that raises money to charter commercial aircraft for one-day, all-expense-paid, round-trip flights for World War II veterans to Washington. Estimates suggest that these veterans are dying at the rate of almost 1,000 a day. The Finnegans felt they could provide an alternative experience by organizing a ground-based program that transported veterans in RVs and buses, spreading the trip over four days. After three months of organizing, fundraising, and finding veterans and volunteer assistants, the first VetsRoll trip left Beloit on May 17, 2010. During that inaugural trip, 117 World War II veterans, eight Rosies and 60 assistants traveled in 13 vehicles. Along the way, they stopped in Pennsylvania at the Flight 93 National Memorial, honoring the plane that crashed there on 9/11. After deciding to continue the project the next year, the Finnegans made some logistic changes. Instead of using RVs, they decided to charter buses, which can carry more passengers, and they expanded participation to include Korean War-era veterans who served from 1949 through 1958. The annual event now takes place each May over the four-day weekend prior to Memorial Day. The trip includes 200 veterans and Rosies, more than 100 assistants who pay their own way (about $500), medical staff and drivers, a pilot coach and support van. This year, the 925th veteran/Rosie will make the trip. Since its inception, VetsRoll has provided this travel at no cost to the veterans or Rosies. Participants and assistants have come from more than 25 states, primarily Illinois and Wisconsin. This year, more than 40 participants come from the greater Chicago area. Last year, the National Museum of the U.S. Air Force in Dayton, Ohio, was substituted for the 9/11 site in Pennsylvania. Before each trip, a team of volunteers headed by Ann and John Schroeder from Rockton, solicit letters and cards from schools, church groups, veterans’ organizations, and others, thanking the veterans for their service to our country, and for their sacrifices. They also secretly contact family members for the same gesture. Last year, they collected more than 8,000 cards and letters for 200 veterans. The second night, the caravan stays in two hotels in Hagerstown, Md., then tours the monuments the next day. Their first stop is Arlington National Cemetery, which contains the remains of more than 290,000 servicemen and women, and their families. After witnessing the Changing of the Guard at the Tomb of the Unknown Soldier, as they leave the area, veterans are often greeted and applauded by students from local high schools. The rest of the day is spent visiting the memorials on the Washington Mall: The Vietnam Veterans Memorial, completed in 1982; the Korean War Veterans Memorial, dedicated in 1995; and the National World War II Memorial, finished in 2004. A group photo is taken in front of the World War II Memorial. “Since we don’t want to act like babysitters, the volunteers form a perimeter around the area, and then let the vets walk around at their own pace, usually in small groups,” says Finnegan. With an early start, the caravan heads for home on Wednesday, escorted by state police cars all the way back to Wisconsin. A stop in Elkhart, Ind., provides yet another emotional event, where Robert Miller, himself a World War II veteran, has created a rehab program to shelter and feed homeless veterans, most of whom served in the Vietnam War. The VetsRoll group stops to witness a color guard and a flag retirement ceremony, then returns salutes from about two dozen of Miller’s Vets, all in uniform. The evening arrival at the Eclipse Center in Beloit is spectacular, with police and fire department escorts, motorcycle and classic car groups joining in the parade, and a fireworks display. Fundraising to pay for all of this is a yearlong project for VetsRoll, with an annual budget of $225,000 to $250,000 in operating costs. A major event is the Hangar Dance, held in Beloit in April, which features two 1940s-era dance bands. The biggest contribution comes from passing buckets at the Walworth County Fair, which raises more than $15,000 each year. Applications for assistants to accompany the veterans far exceed the number needed each year. More than 200 applied for 140 spots this year alone. A fully trained professional medical staff of 30 to 35 EMTs, LPNs, RNs, paramedics, CNAs and physical therapists attend to any and all medical emergencies. Finnegan’s long-term plans might include extending invites to veterans from 1959 to 1963, eventually including Vietnam War veterans. Hopes for people to form other VetsRoll “chapters” have as yet gone unfulfilled. These are the stories of a few veterans and Rosies who recently traveled with VetsRoll. Edward Jaros, age 86, served in the Navy during World War II, and in the Army during the Korean War. He attended VetsRoll in 2013, and now lives outside Woodstock. Jaros was in high school during most of World War II, but he had ambitions to become a pilot. He worked at a local airport to earn flying lessons, so he could “get a jump on those guys who might be drafted with me,” he says. When his enlistment ended in 1950, Jaros was transferred to the Naval Reserve, but the Korean War intervened and he was drafted into the Army in 1951. After basic training, he was sent to Japan, then on to Korea as part of the Second Infantry Division. Jaros’ job was to measure temperature, air density, winds aloft and other data that would affect the trajectory of artillery shells in flight. Jaros left Korea in 1952 and was transferred to Washington, to be attached to an anti-aircraft battalion assigned to protect the White House. A few months before his VetsRoll trip, Jaros went on an Honor Flight from Madison, Wis., but he found it a bit hectic. Eugene Kleindl, age 91, of Capron, Ill., served as a medic/litter bearer in the 358th Regiment, 90th Infantry Division, from 1942 through 1945. He landed at Utah Beach in Normandy, France, on D+1 (June 7, 1944), and was in combat for more than 300 days. During that period, Kleindl kept a diary in which he recorded his thoughts and experiences. Kleindl and his older brother, Cliff, two of six siblings, enlisted in the Army together at Rockford’s Camp Grant in 1942. They were both at Normandy during the invasion, but in different companies. Kleindl was soon in the thick of the fighting through the French bocage country, carrying both American and German wounded from the battlefield to nearby aid stations. Once, he retrieved a colonel who had been hit by machine gun fire, and he was later awarded the Bronze Star for his bravery. As part of Patton’s Third Army, Kleindl crossed France into Belgium, where he was part of the Battle of the Bulge that December. He entered Germany through the Siegfried Line, crossed the Rhine River and ended up in Czechoslovakia at war’s end. Due to prior agreements between Allied leaders, the U.S. Army was ordered to withdraw into Germany and relinquish recently conquered territory to the Russians. In spite of a “no fraternization” order, Kleindl became friends with a woman in Nabburg, Germany, whose husband was a prisoner of the Russians. Kleindl corresponded with the woman and her family after the war, sending them “care packages” occasionally. “I still get letters from them to this day,” says Kleindl. Kleindl has also participated in the Honor Flight, but found that last year’s VetsRoll gave him more time to meet and talk with other veterans. In addition to his diary, Kleindl has an extensive collection of World War II memorabilia, although he has given most things to his grandson. He speaks occasionally to youth groups about his wartime experiences, and was honorary parade marshal for Rockford’s Memorial Day parade in 2008. Ruby Gregus, age 88, of Beloit, Wis., worked in local defense plants during World War II, so she went on VetsRoll last year as a representative of “Rosie the Riveter,” an icon of wartime propaganda promoting the role of women in the war effort. Gregus worked at Fairbanks Morse in Beloit, manufacturing bearings and magnetos for ships; at National Lock in Rockford, making hand grenades; and at an electronics factory assembling field radios. Gregus’ husband, Louie, served in the Navy during the war. His ship was torpedoed by the Japanese near Alaska, but he survived the sinking. “I remember, we always worried about the people close to us who were in the military, wondering: Were they coming home?” she says. Gregus’ brother, Ralph Tuttle, served in the Marines during the Korean War, and he accompanied his sister on the VetsRoll trip. Eugene Banke, age 91, served in the Army during World War II and Korea, with a brief stint in the Air Force in between. The Elgin resident attended VetsRoll last year. Banke enlisted in the Army in 1940, and trained with two armored divisions before being sent to Europe as a replacement. He ended up as a combat engineer in the 36th Infantry Division. Banke enlisted in the Air Force from 1946 to ‘47, then joined the Army National Guard. His unit was activated during the Korean War, but he spent his tour of duty in California. Barbara (Bobbe) Stuvengen of Janesville, Wis., enlisted in the WAVES (Women Accepted for Voluntary Emergency Service), the women’s navy reserves, in 1945. Her first assignment was in Washington, with the Chief of Naval Communications. About the third day after her arrival from boot camp, she was sent on an errand by one of the officers. As she waited in the rain for a bus, a large black car pulled up and a petty officer got out, went around and opened the passenger door. A short, stocky man got out and went into the building. After the war, Stuvengen trained to become a flight orderly with the Naval Air Transport Service (NATS), and was stationed at Moffett Field in California. Her duties took her on numerous flights between California and Hawaii. Stuvengen enjoyed her experience on VetsRoll in 2010, but thinks the ones who were most impressed by the trip were probably the older guys who never talked before about their wartime exploits. “A lot of families still don’t know the stories of what they went through,” says Stuvengen. “But when they got on this trip, where 90 percent of them all had experienced similar situations, they acted like a bunch of teenagers chattering away. They had a ball. To volunteer, contribute funds, or sign up a veteran, view the website at www.VetsRoll.org. This year’s trip is May 18-21. This entry was posted on Friday, May 2nd, 2014 at 12:00 pm	and is filed under Features, Top Posts. You can follow any responses to this entry through the RSS 2.0 feed. Both comments and pings are currently closed. Thank you Jon and NW Quarterly for getting the word out about organization! You did a very nice, accurate job on your piece. One thing not mentioned is that for our heroes who come from the Chicagoland area (as well as WI and the rest of IL), we offer optional pre & post trip bus routes that pick up our heroes the Saturday before the trip, bring them to Beloit for registration and dinner…then to a local hotel for a good night’s rest…then back to the Eclipse Center at 4:14am the morning of the trip. The same is offered the evening we get home and then back home again on Thursday! Participants who opt for this pre/post trip option do pay a nominal fee for the buses and hotels…otherwise the four days of the trip are absolutely free! Hope to see your readers at the Victory Parade in Beloit on Wednesday evening, May 21st!! How do I get some copies. Nicely done! would be a great memento.